My favourite toothpaste. Prefer this to the mint ones they have. The smell makes brushing feel fancy and I like the tingle. You will probably use it up faster since thereâ€™s no crazy synthetic bubbles youâ€™re used too...but itâ€™s better than **** in your body! I like the flavor itself. The cinnamon is really powerful. If you are scared that it might burn your mouth, it does a bit but I enjoy it. The issue is that it doesn't foam up enough to last the entire time you brush which is what I look for in a toothpaste. I really enjoy the cinnamon flavour! Some people have commented that the flavour is overpowering and numbs their mouth, but I don't find that (i've been using this toothpaste for several years), which leads me to believe it's really down to personal taste buds! I do find their orange and anise to be super strong, however (the essential oil taste). I do agree that you need to use more paste than you would with a conventional paste, but I'm happy with how this Green Beaver toothpaste cleans my teeth and prefer it over mainstream brands that use foaming agents and toxic ingredients to give you that "clean" feeling. Flavour is very nice, but the ability of this to clean teeth is not up to snuff. I have to use 4 times the amount of commercial toothpastes to come close to their cleaning ability. This toothpaste is very cinnamonny. Tastes like those red hot candies. I like the flavour but donâ€™t find the paste as effective as Toms or Earthpaste. I love green beaver products but after trying this, their toothpaste isnâ€™t my favourite. Love the spicy (but not too spicy taste) and my mouth feels really clean. Wish there were more product in the tube, though. I have recently discovered Green Beaver and I am loving their products! From their lotions to their cleansers, all their products are amazing! This toothpaste is no different. The tube has a decent size and the taste is great. Will definitely buy again and try other flavours! I have been using the green beaver company toothpastes. I love them, especially the cinnamon one. I also like the star anise one( it tastes like black licorice). Excellent product ! A must try ! It is also vegan and cruelty free. Definitely prefer the cinnamon over the mint. Love this stuff. Wonderful flavour and vegan! So excited to find. The best tasting toothpaste , not too strong. Great for sensory sensitive!!! We love greenbeaver, it's the only toothpaste we use. Changed it up by trying this flavour. Adults love it. Nice and spicy at first but dies off to a tolerable level to compete brushing! I usually buy the mint flavour. I'm glad I tried the cinnamon. I will buy this again. I have used this Toothpaste for years. The Cinnamon flavor is great! The natural ingredients is why I bought it and the yummy taste is why I continue to use it. Being a Canadian company is a great bonus. This is the best tasting toothpaste that manages to effectively clean teeth that I've ever come across! And it's a bonus that Green Beaver is a Canadian company producing natural, organic products. Definitely going to be ordering this again & again! The natural ingredients are needed for me so that my mouth does not burn, and the cinnamon flavour is great. I will get this brand again. I have to use natural toothpaste and was thrilled to find this product on Well.ca. I love cinnamon flavoured toothpaste yet none of my local stores carried this flavour of the brand. Will definitely be ordering it again! I love the taste of cinnamon and this toothpaste doesn't let you down. Being a diabetic it is important to have fluoride to fight cavities so I use this toothpaste once a day to freshen my breath. It does a great job and cleaning the tooth surface as well. Taste is great! Gets the job done! Naturally of course! Love using the Natural Products and the taste is great....will recommend to friends for sure!! An amazing product. Tastes great, does the job, and I feel amazing knowing I'm supporting an all-natural Canadian company. Will definitely be trying their other flavours. I like the flavour. I still use a regular toothpaste as well but wanted to add in a natural one too. I love it!! It's a great toothpaste - happy I made the switch. This is the only flavour of toothpaste my 5 year old will use without complaining...and we have tried MANY! Great tasting toothpaste. Would buy again. This product cleans well, is reasonably priced and tastes great! Good flavour, good ingredients, and I like that Green Beaver doesn't test on animals. It doesn't leave your mouth as powerfully fresh as conventional toothpaste does, but I haven't found a natural toothpaste that does. 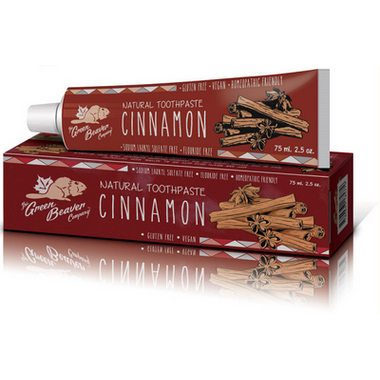 Great natural option for toothpaste, love that it's fluoride free and the cinnamon flavor is nice too. We switched to natural toothpaste a year ago and this is our favorite brand so far. We love it. If cinnamon is not for you, try the orange one. This is just okay. I like the cinnamon, but it really doesn't feel like you've even brushed your teeth after using it. I usually like Green Beaver products, but this was the first time trying the toothpaste. I'll switch to another natural toothpaste instead. This is my favourite natural toothpaste! (and I have tried many!) My 10 year old daughter love it too. This is the first natural toothpaste that I have tried and I am not a fan. I don't like the cinnamon flavour, it leaves a weird unclean taste in my mouth. A minty flavour may be more to my liking? Have been using the Green Beaver products for several years now, and won't even consider using any other toothpaste! This is one of our favourite flavours! We love this toothpaste and been using it for years. My husband and i use the cinnamon flavour while i buy the green apple one for my toddler. I am recommending this product all the time! My family loves using this brand of toothpaste. Great product at a decent price. Cinnamon and peppermint are the favorites. This toothpaste tastes great! It is our family's favorite after trying many other brands. The Green Beaver Cinnamon Toothpaste tastes great but is too spicy and burns my mouth! I won't be buying the Cinnamon flavour again. Great toothpaste, the cinnamon flavour is amazing. I am not sure how much it is protecting my teeth but I use it in combination with other natural methods of keeping teeth clean and without stains. Will continue to buy Green Beaver products, use the toothpaste and face wash and they are both great products. Great toothpaste, love the cinnamon flavour!